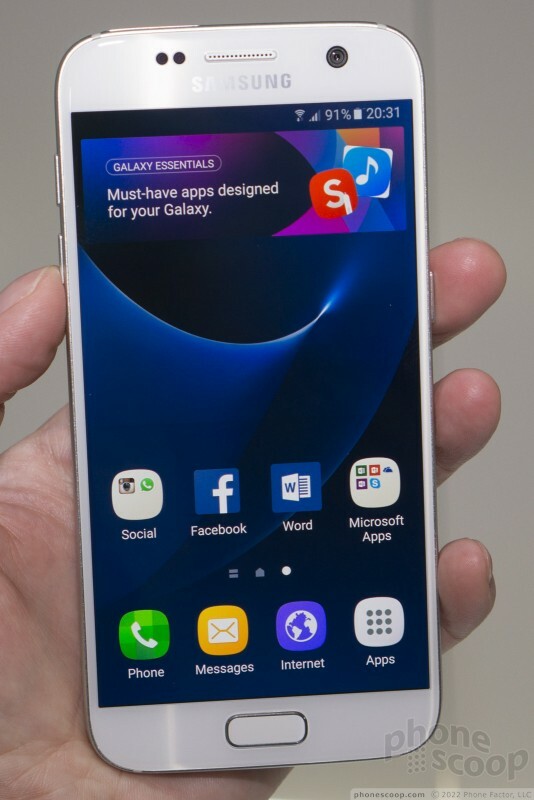 Samsung's 2016 flagship smartphones are updates to last year's models. Each features modern specs and brings water resistance to the table, as well as support for memory cards. 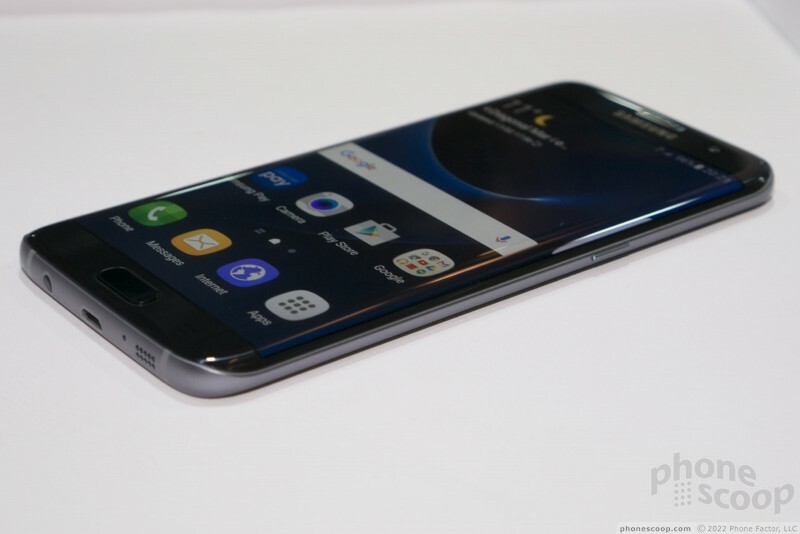 Samsung argues the Galaxy S7 and S7 Edge are a lot more than minor upgrades. Are those claims accurate? 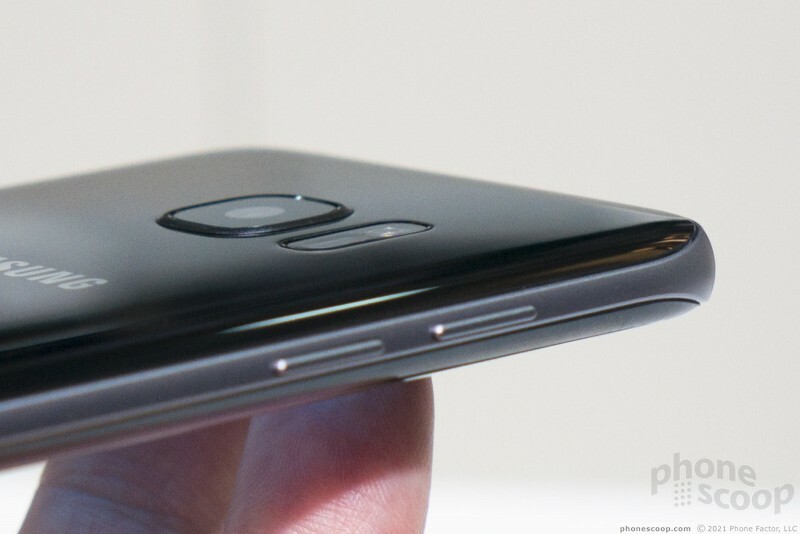 Here are Phone Scoop's first impressions of these new phones. 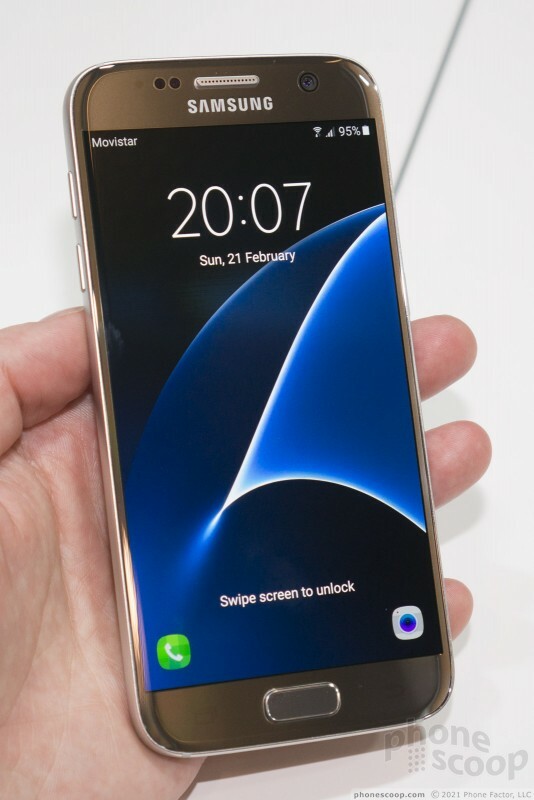 Samsung is back! 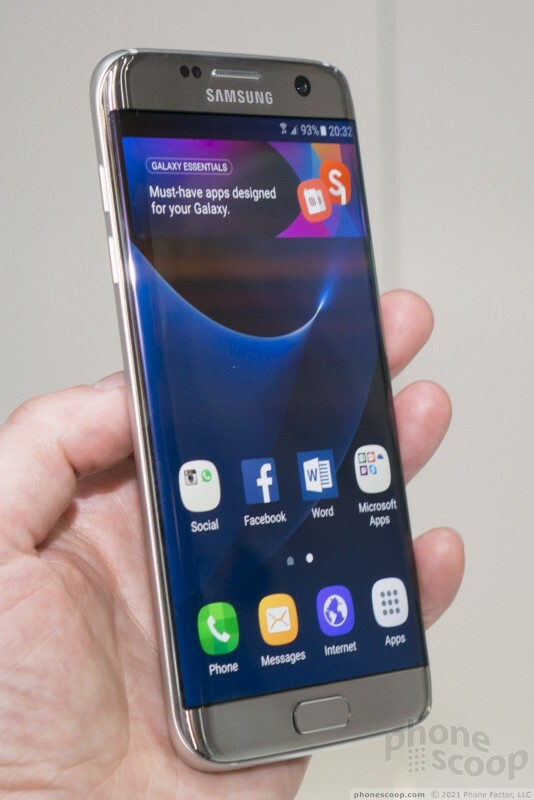 The company announced its flagship lineup for the year in Barcelona, called the Galaxy S7 and Galaxy S7 Plus. 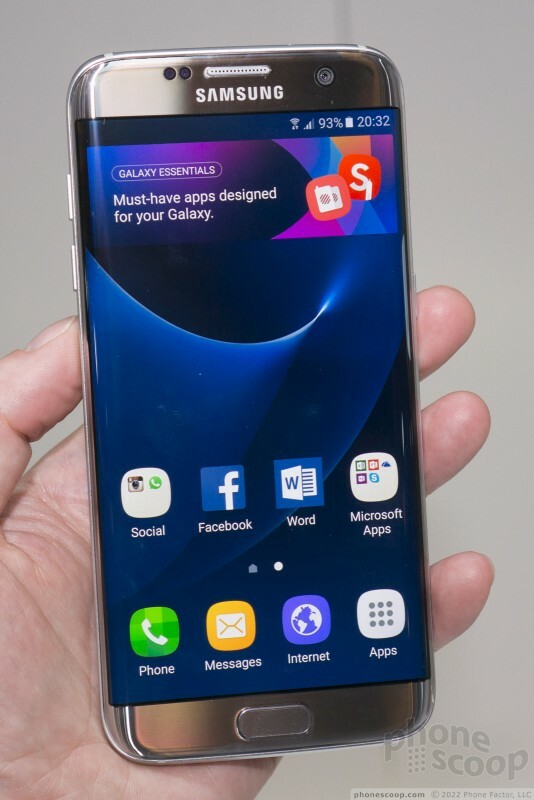 The phones are, by and large, quite similar to the 2015-era GS6 and GS6 Edge. There are obvious differences, but the overall effect isn't all that changed. 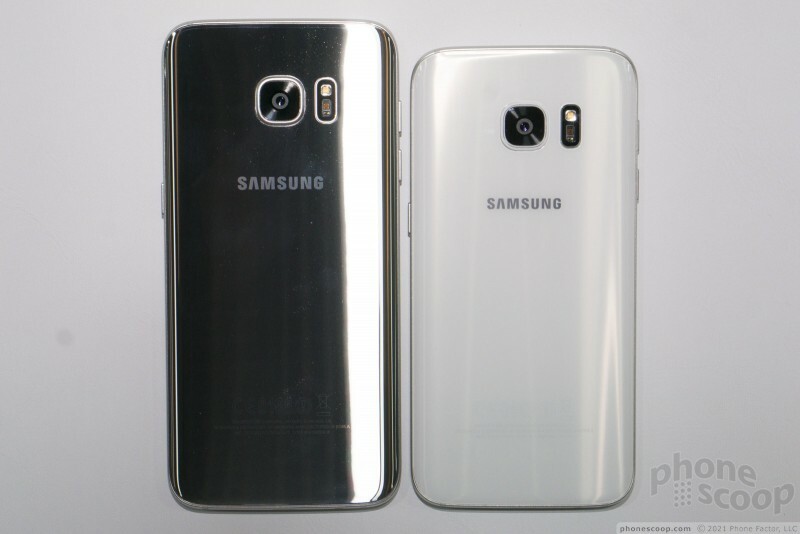 To start, the GS7 and GS7 Edge are more refined in their design. 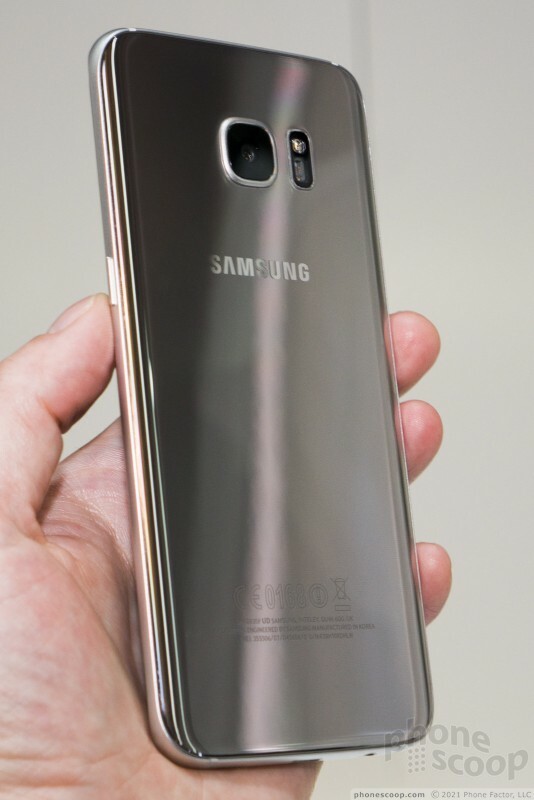 Samsung took the metal-and-glass construction of last year's phones and made improvements all around. 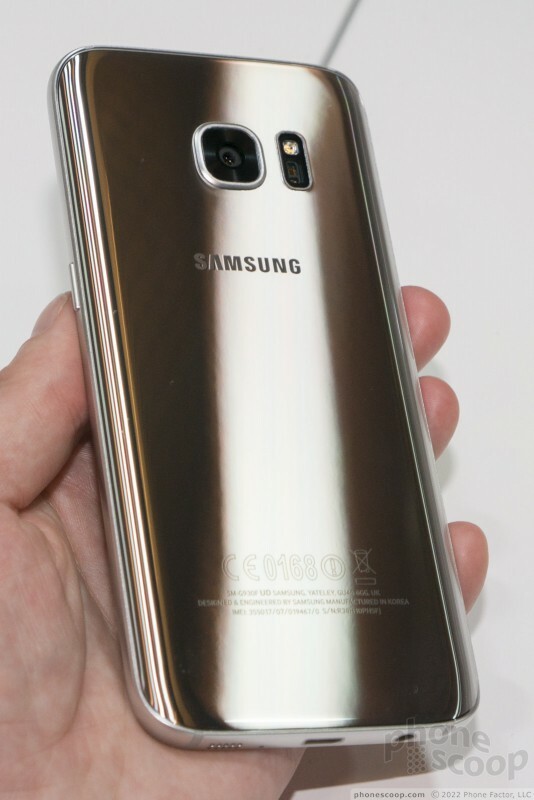 For example, the glass is curved in more places where it meets the metal, which smooths out the seams all the way around. 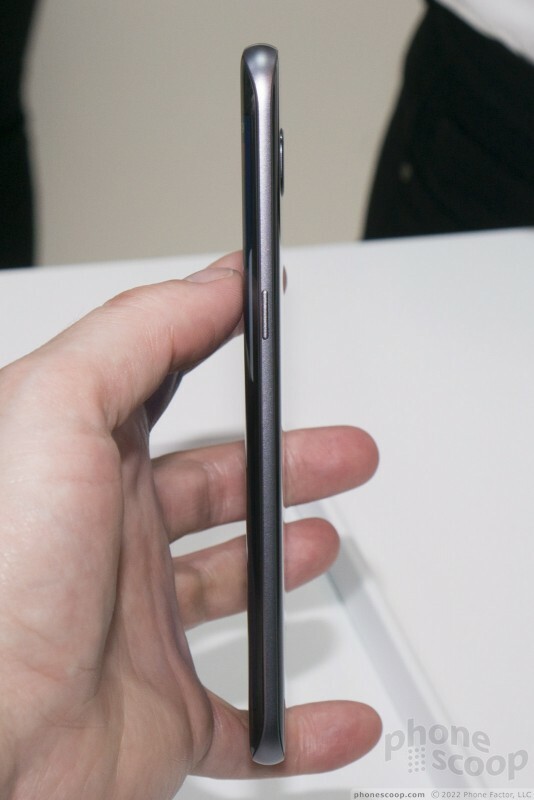 Samsung took care to reduce the thickness (or at least improve the curve's shape) along the side edges, which helps reduce the phone's footprint — if not in reality, at least perceptively. The quality is of the highest caliber. 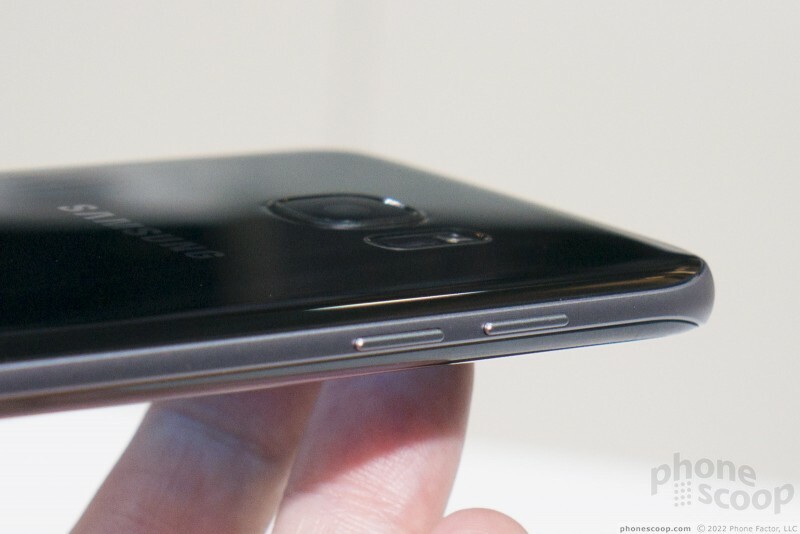 Samsung has come a long way from the old designs of yore. 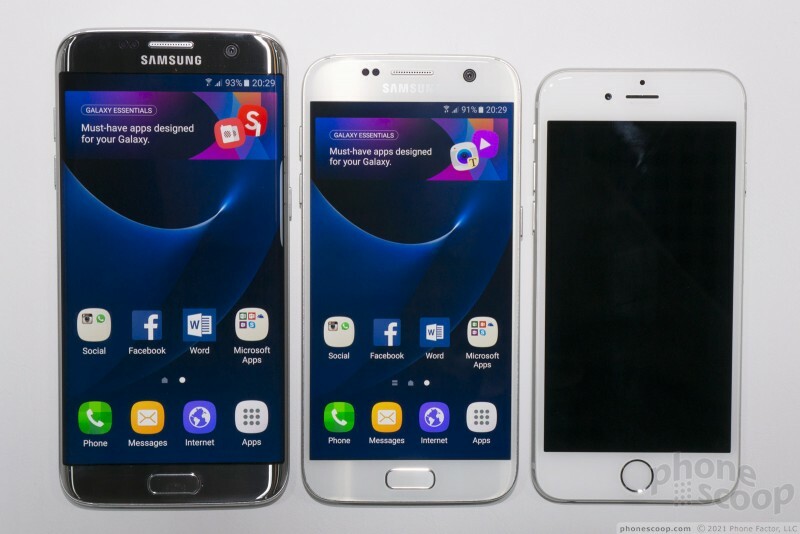 The GS7 and GS7 Edge are the same, but also different. The biggest bullet point is the IP68 rating against water exposure. The phone's can sit in a meter of water for up to 30 minutes. That's a big deal. 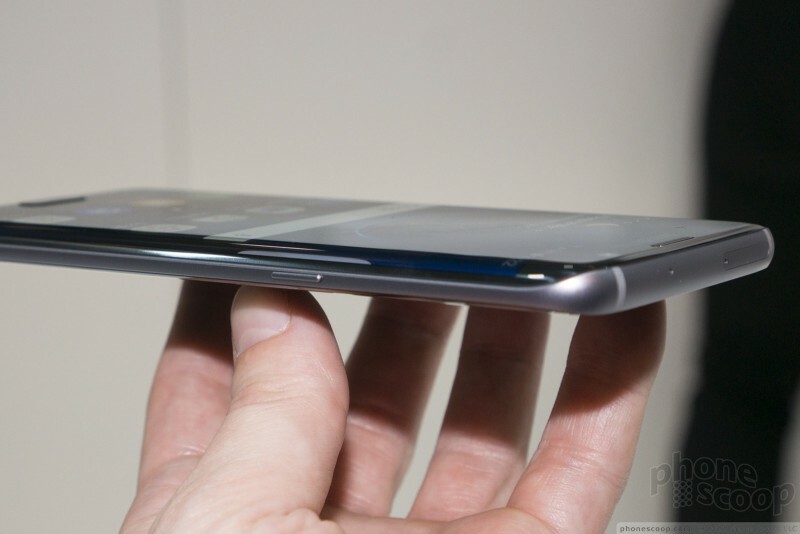 Samsung took pains to protect the phone by sealing up the innards. You'll find no annoying plastic hatches or flaps here. 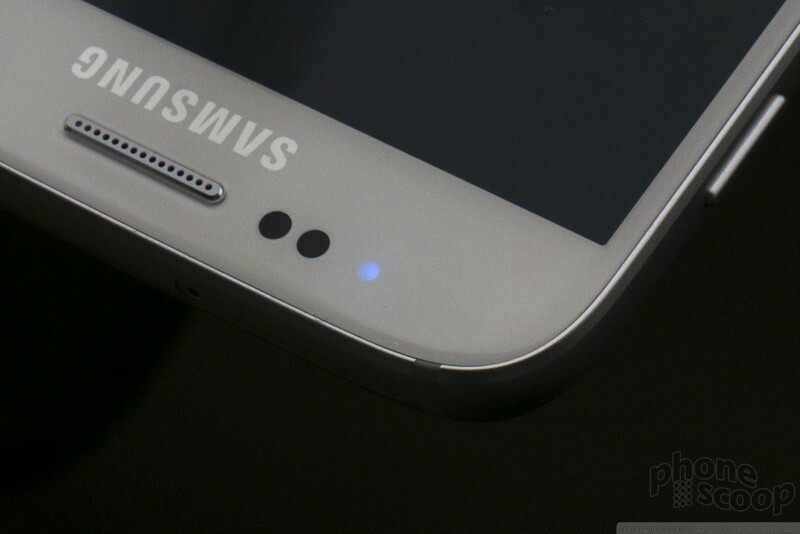 I love that it is waterproof even with the USB port and headphone jack exposed. This solves a big pain point for consumers. 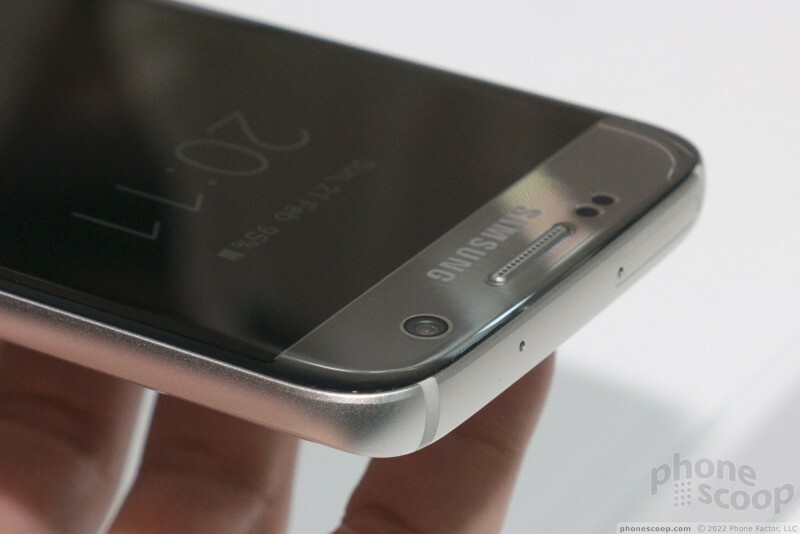 Samsung also brought back the memory card slot. 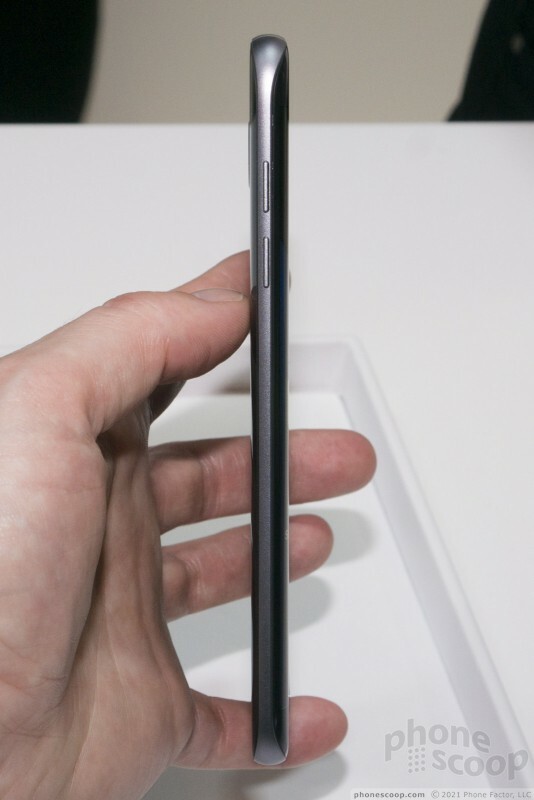 The phone regain support for expandable storage thanks to the slim tray that's part of the SIM card slot. 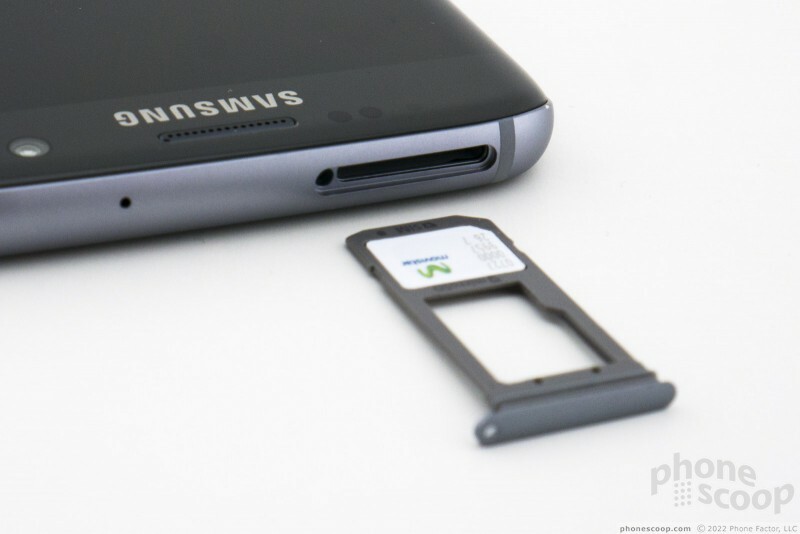 Fans cried foul last year when Samsung stripped the memory card slot from the GS6. Sadly, the battery is still sealed in tight. The good news? 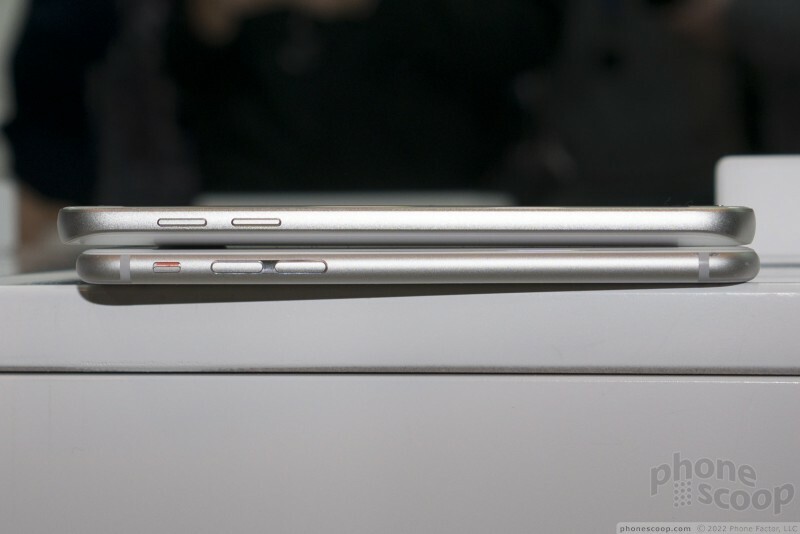 The batteries are noticeably larger. 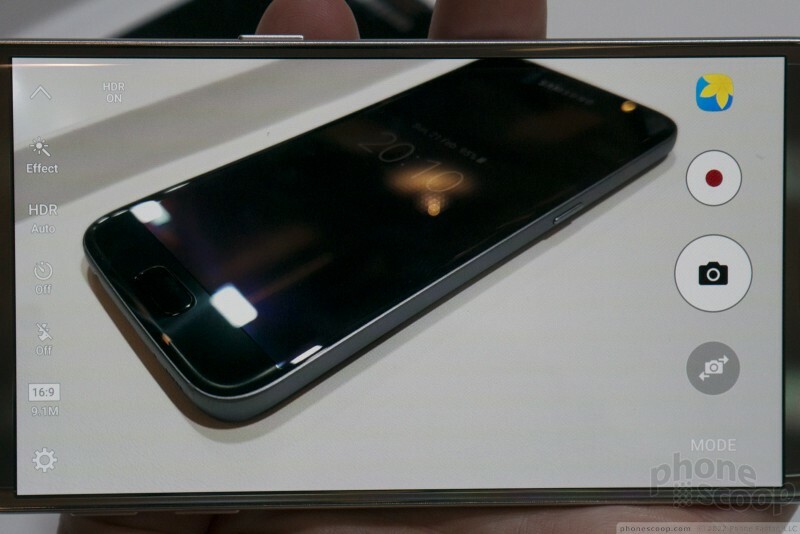 The GS7 gets a 3,000 mAh battery, while the GS7 Edge gets a 3,600mAh battery. 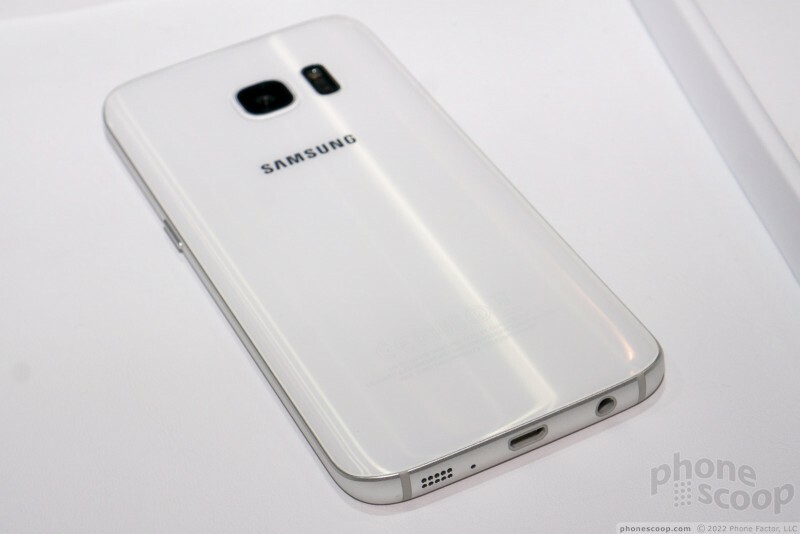 For comparisons' sake, the GS6 has a 2600mAh battery. Further, the power cells support rapid charging, and wireless charging from both Qi and PMA chargers. 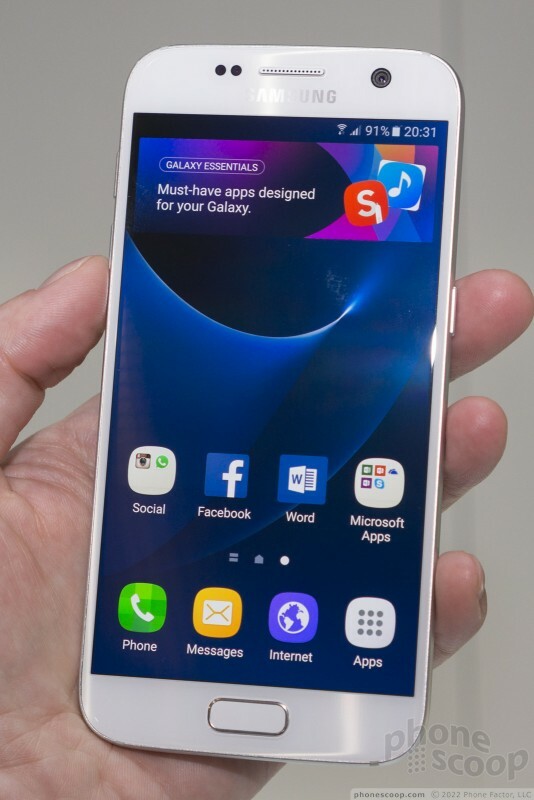 Samsung promises battery life will be better. 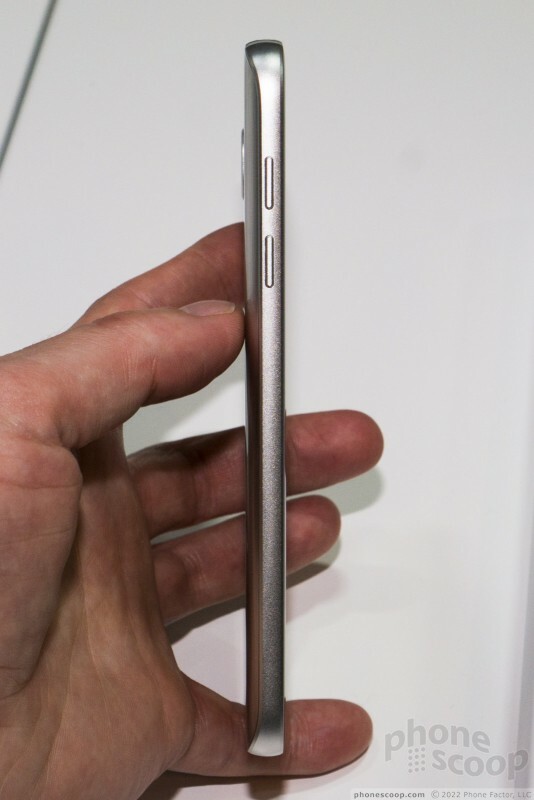 Both phones stick to micro USB ports, which is understandable in some sense but still rather odd. 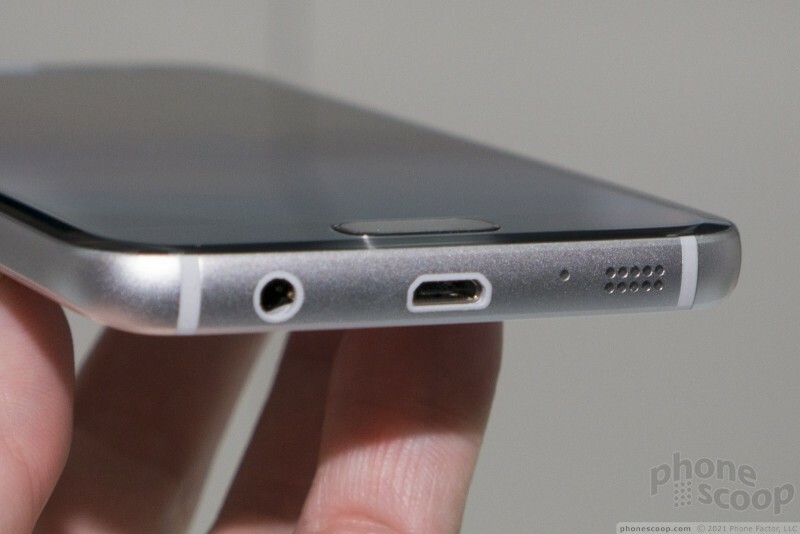 LG said it is moving forward with USB Type-C, which is the agreed upon future format. 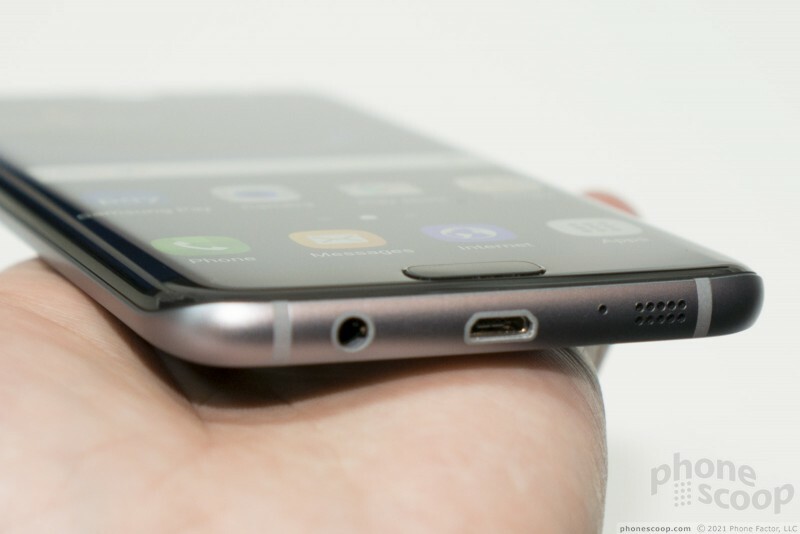 Why Samsung is sticking with the older port is anyone's guess (but it's likely financial.) 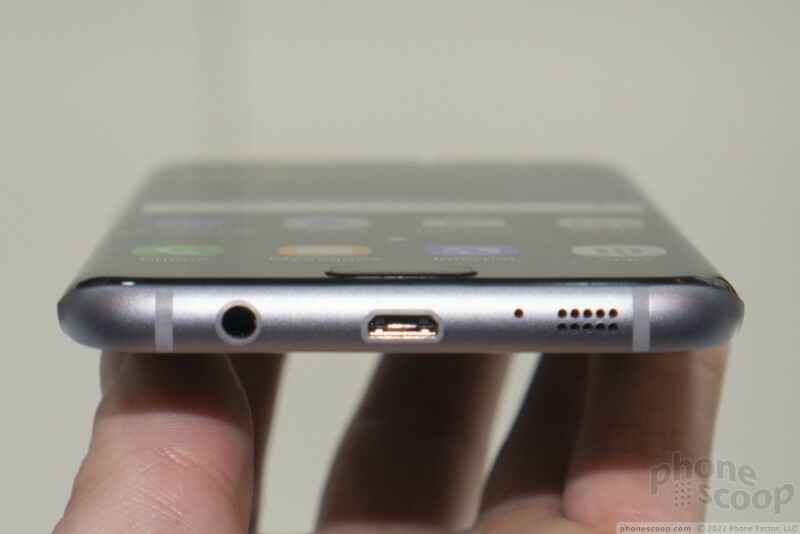 The headphone port is on the bottom as is a microphone and holes for the speaker. The metal frame wraps all the way around the outside. 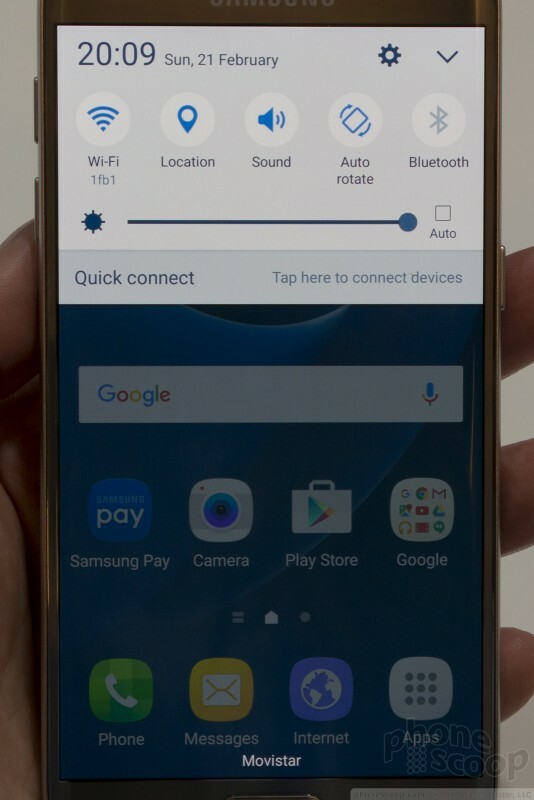 The volume buttons are on the left edge. They are rather thin, but have good travel and feedback. 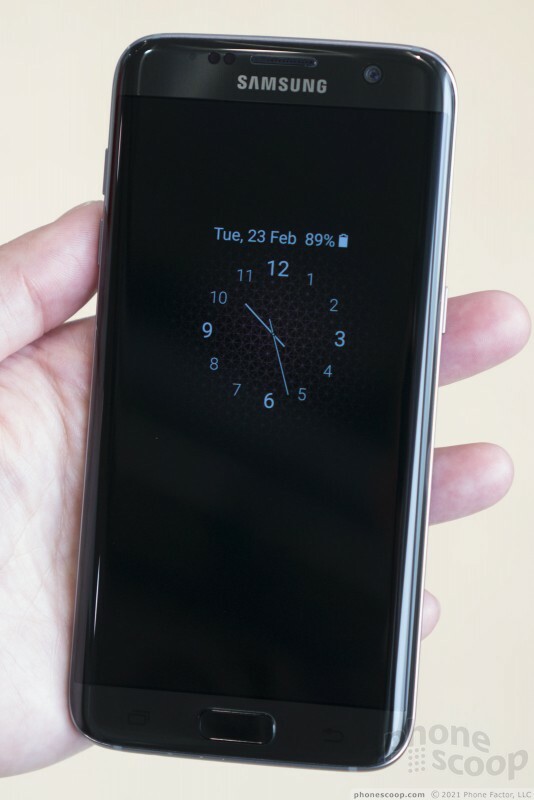 I'd say the same of the screen lock button, which is on the right side. 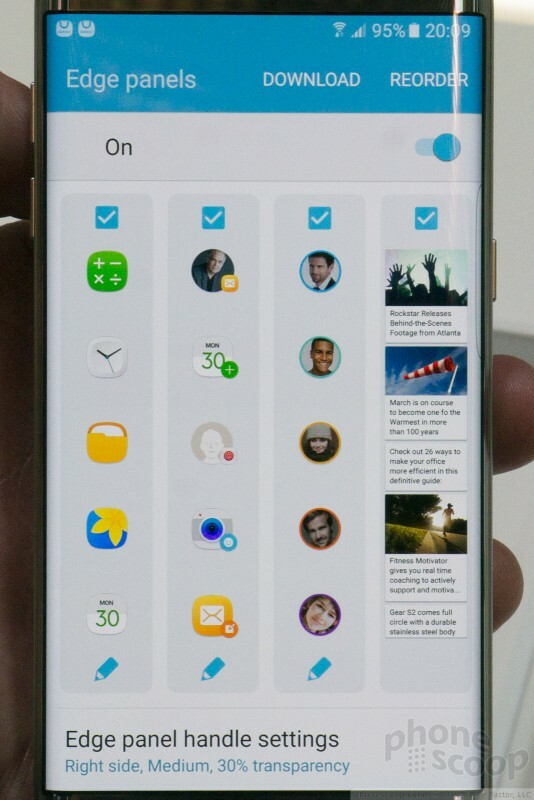 Samsung is serious about its physical buttons, which is why you'll see a large home key on the front under the display. 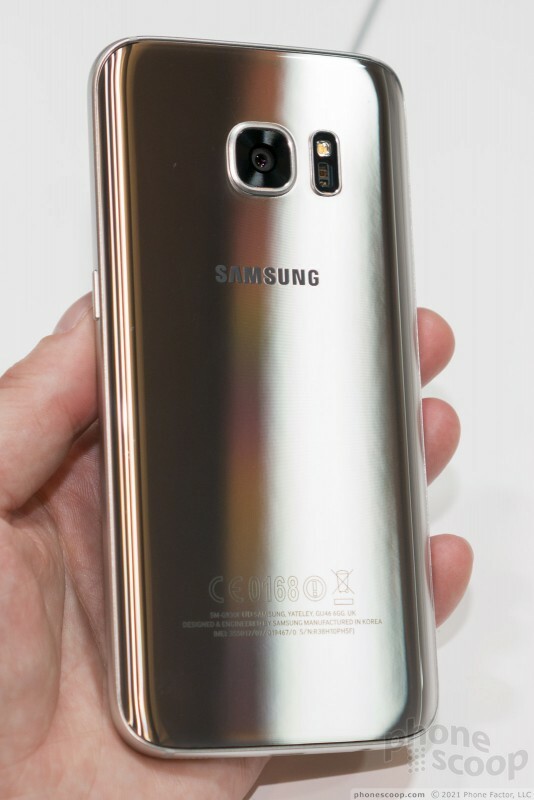 As per usual, it is flanked by capacitive keys for navigating back and multitasking. 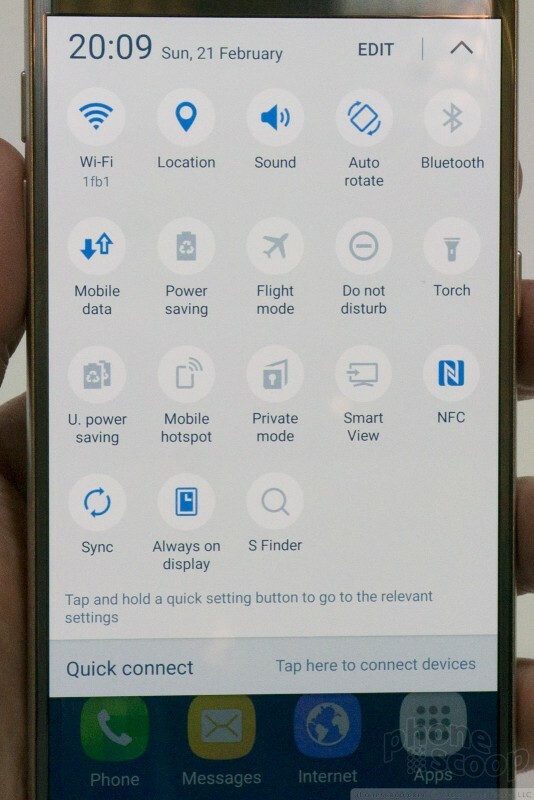 The home button, which doubles as a fingerprint reader, is really easy to find and has excellent travel and feedback. Another design improvement: the camera module. 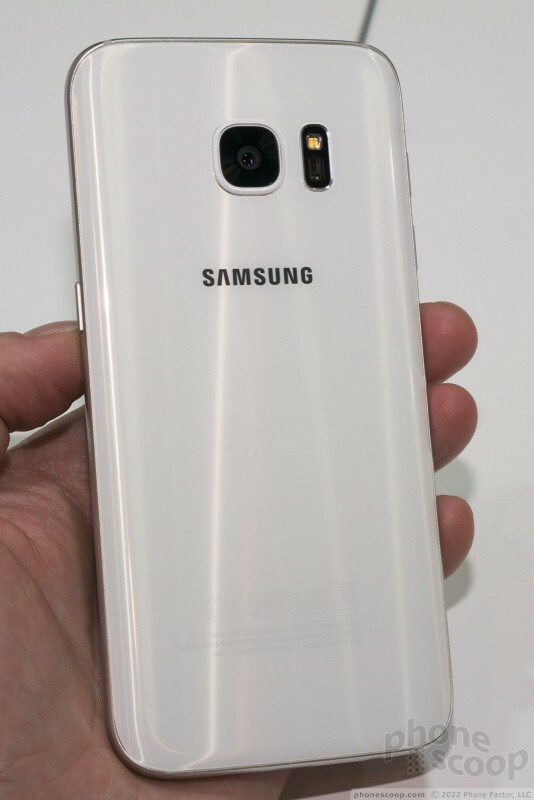 Samsung was rated for the large, unsightly camera module on last year's phone, which protruded noticeably. The camera profile is much slimmer on the GS7 and GS7 Edge, which is a good thing. The combo flash/heartrate sensor is situated just to the right of the camera. 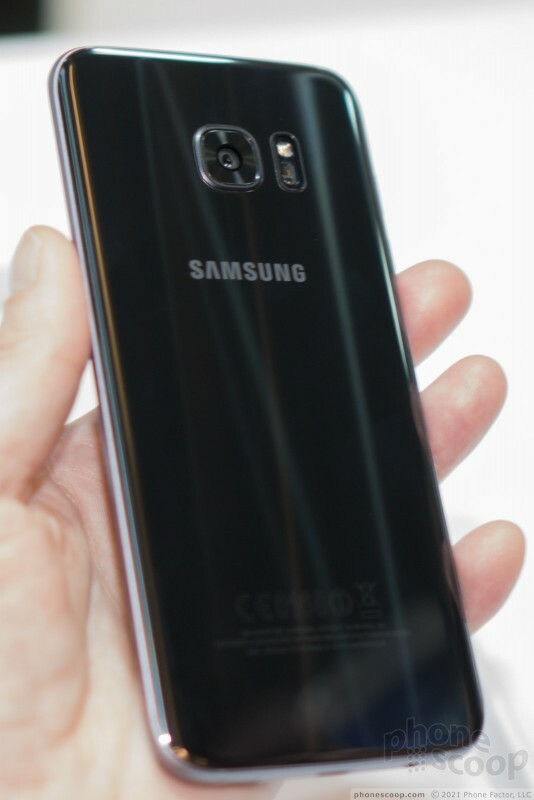 The Galaxy S7 has a 5.1-inch quad HD screen and is the smaller of the two phones. 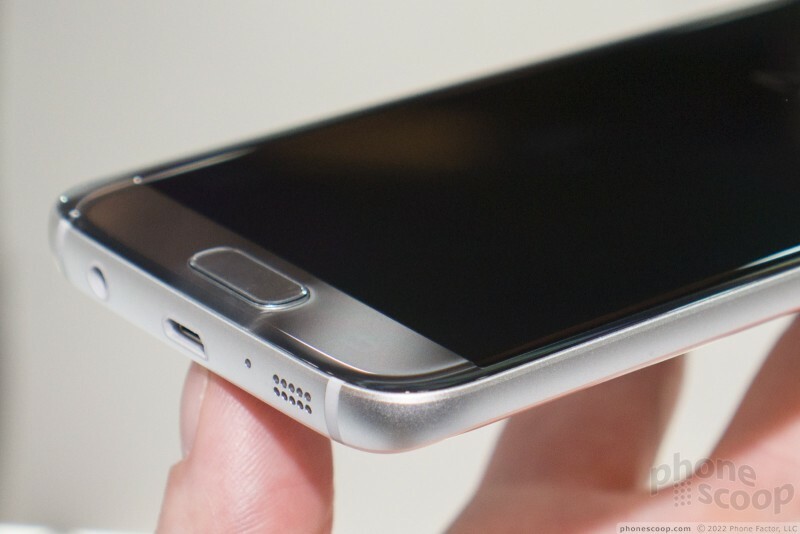 It is about the same size as last year's GS6. I found it to be slim and comfortable to hold and use. 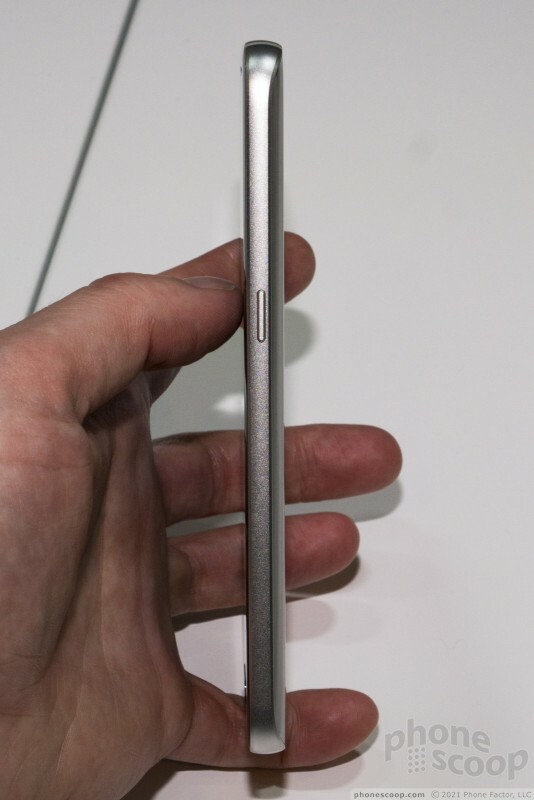 It is very thin and light. 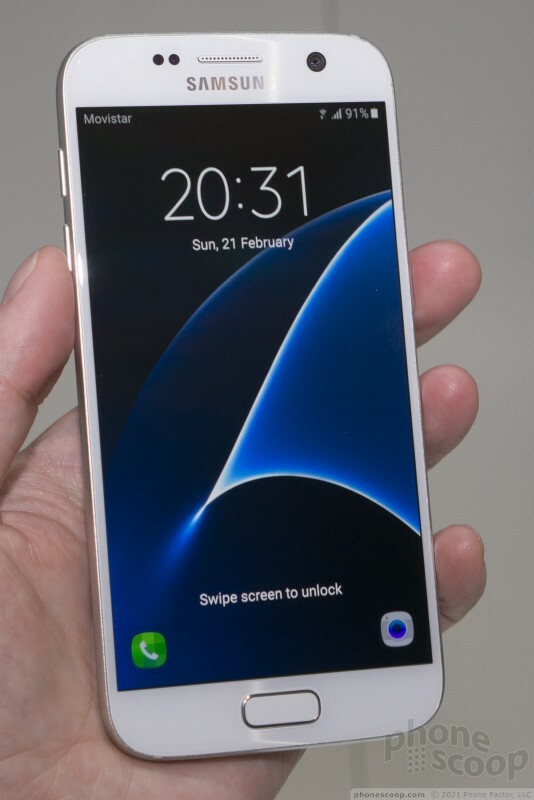 The screen looks amazing, with an incredible pixel density. 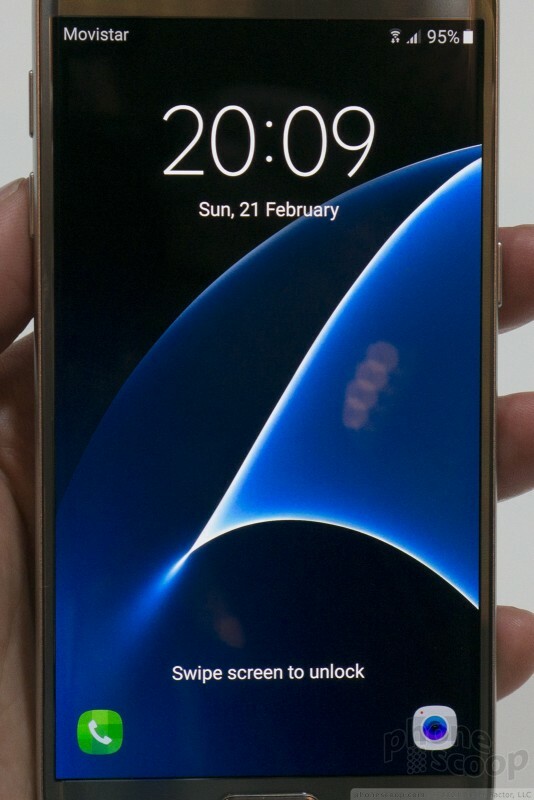 Samsung's AMOLED screens have always been impressive. 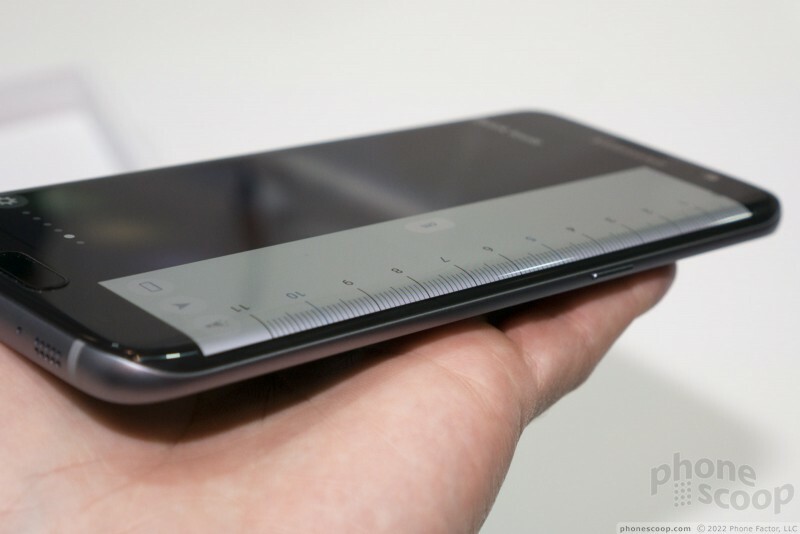 It's quite an impressive phone and should resonate well with people who prefer "regular" phones. 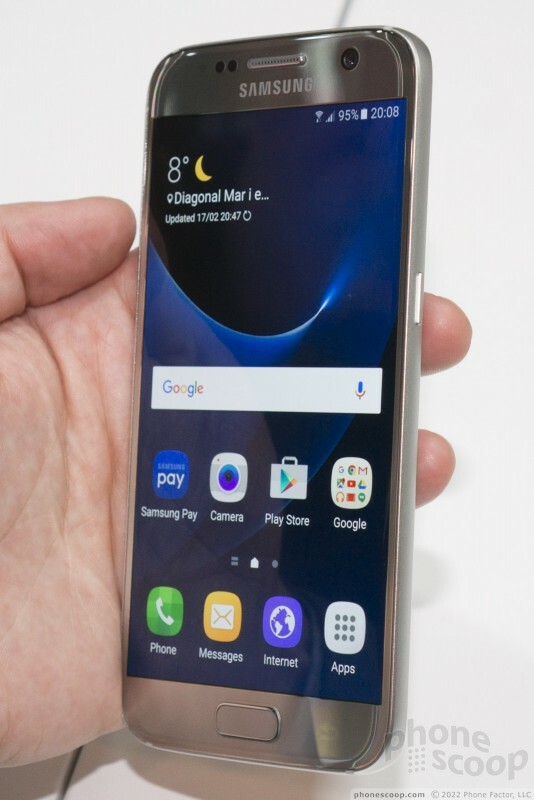 The S7 Edge has a larger 5.5-inch quad HD screen, and the footprint is noticeably larger than that of the GS7. 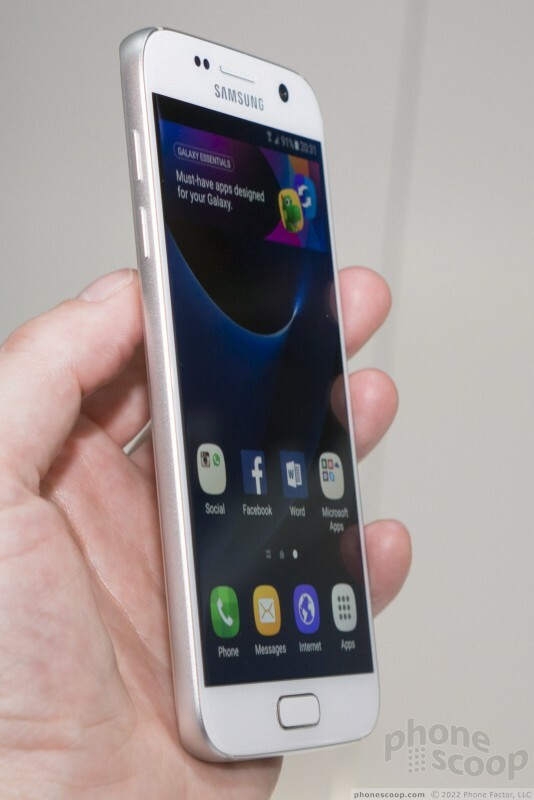 It is closer in size to the GS6 Edge+ from last year, and ostensibly replaces that device in Samsung's lineup. 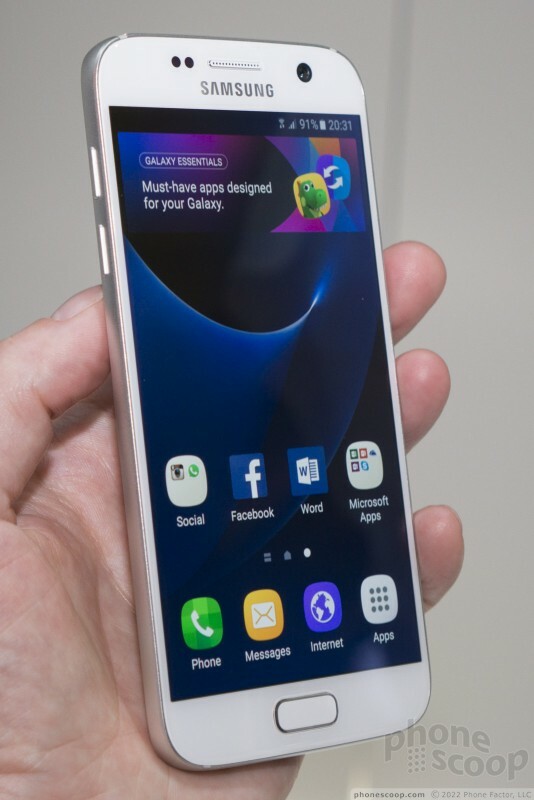 The GS7 Edge has the signature curved glass on both sides and specialized content that is accessible from those edges. 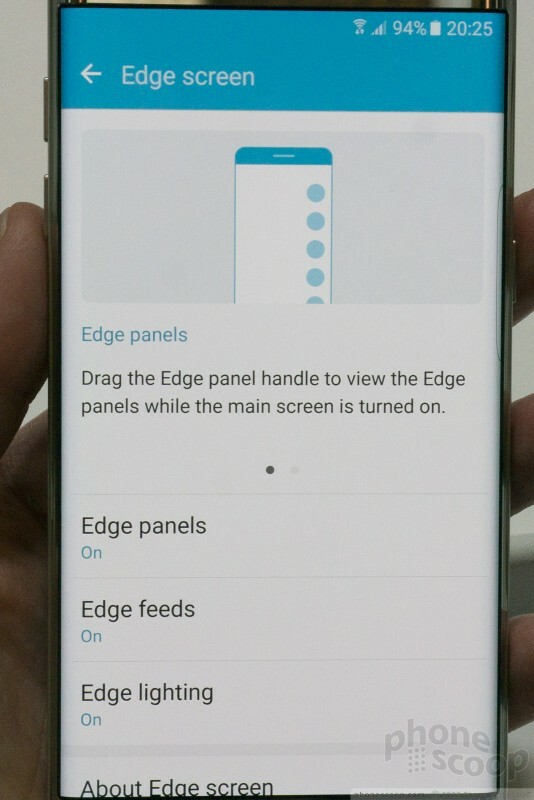 Samsung did a great job updating the Edge apps and content. It is must easier to access, customize, and interact with. 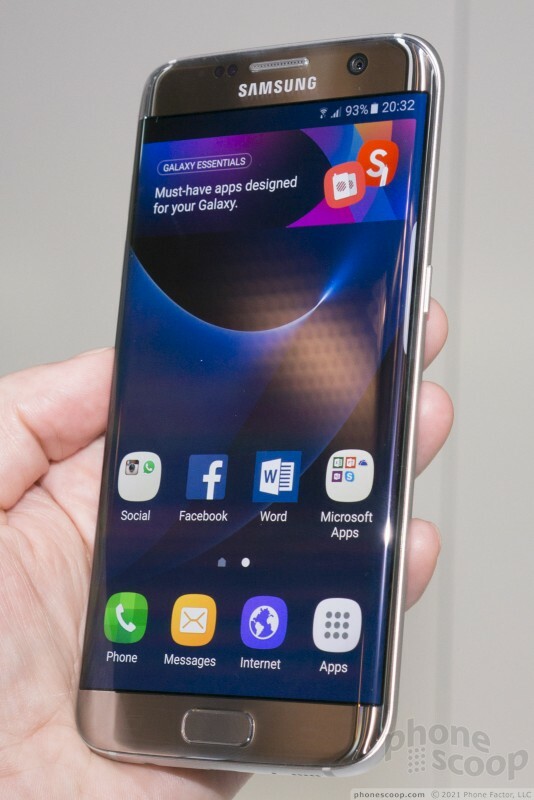 The down side is that it is no longer subtle; the Edge Screen apps consume a larger portion of the home screen and are thus rather in-your-face. 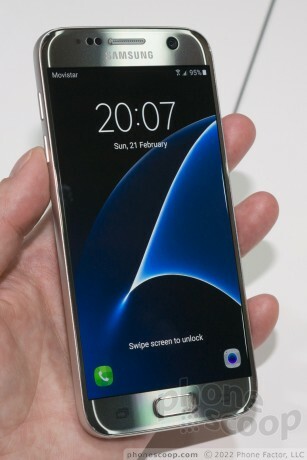 Samsung did a really good job with the hand feel of the phone. 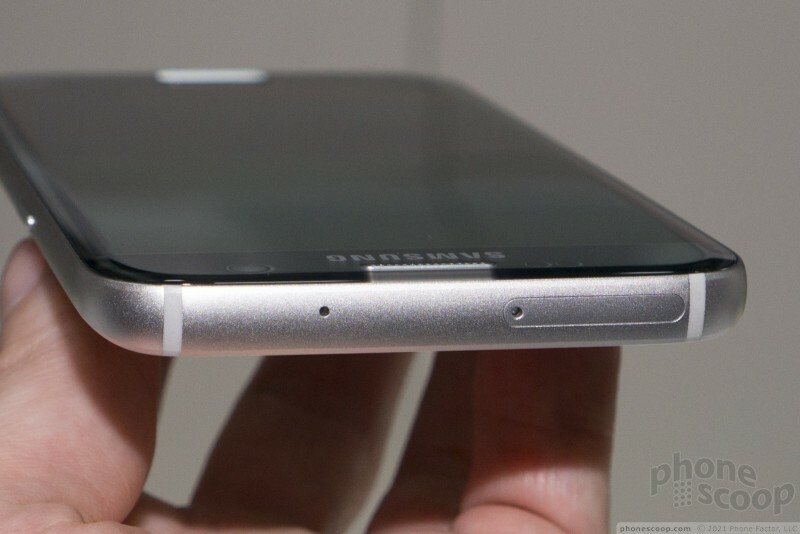 The side edge is no longer as sharp, which makes the phone far more comfortable to hold and use. I was pleased with the overall experience with the phone. 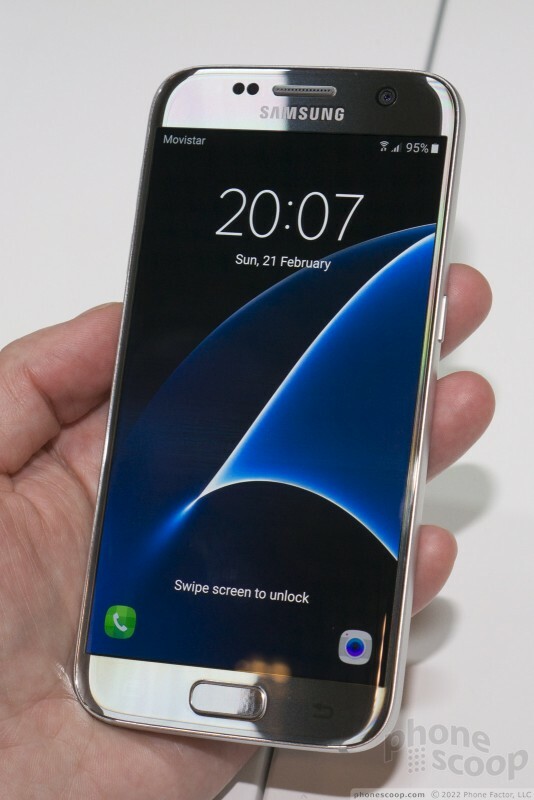 It is more for the phablet lovers in the crowd. 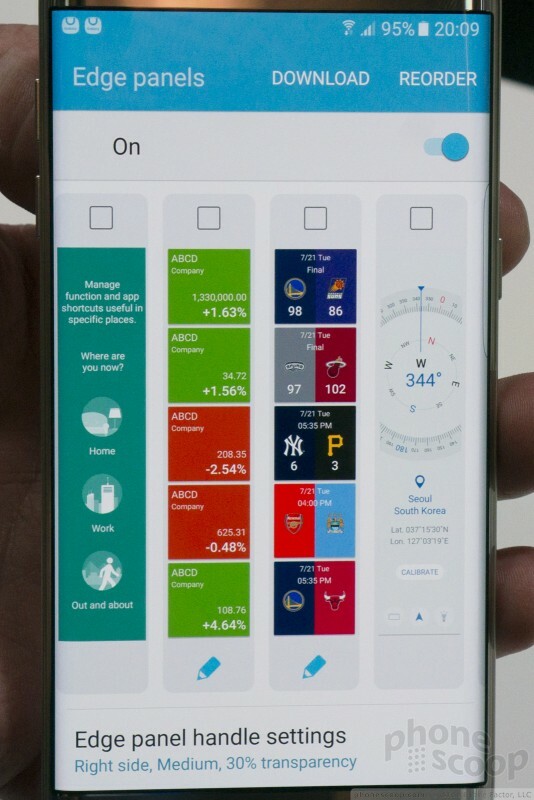 Both handsets run Android 6.0 Marshmallow with Samsung's user interface tweaks on board. 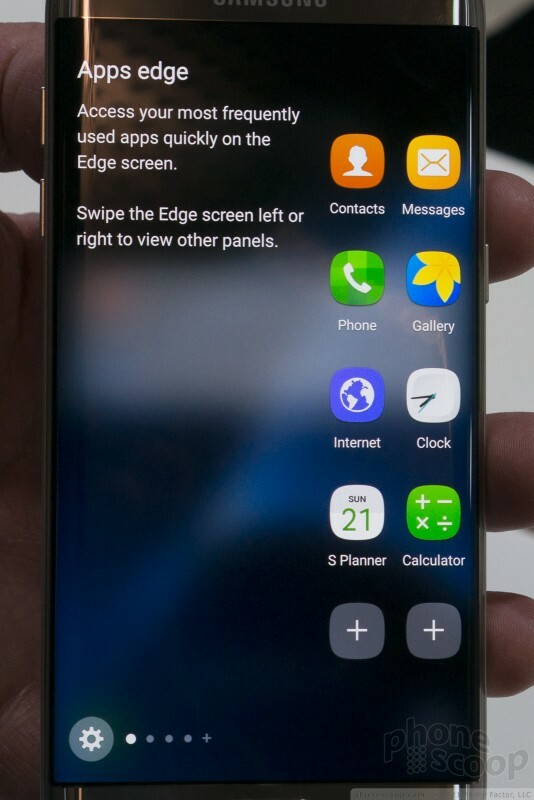 Samsung did not once say "TouchWiz" during its presentation, so it is hard to say if that branding has been retired. 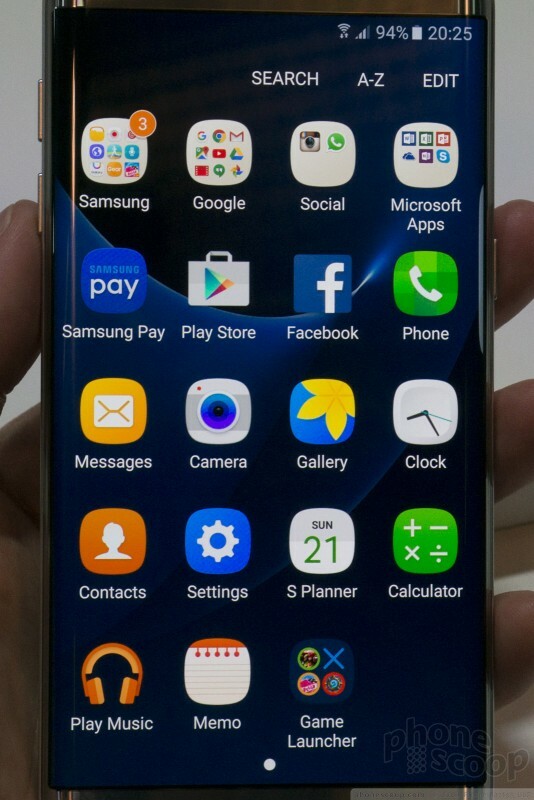 The icons, fonts, and general appearance of the UI is similar to the GS6. 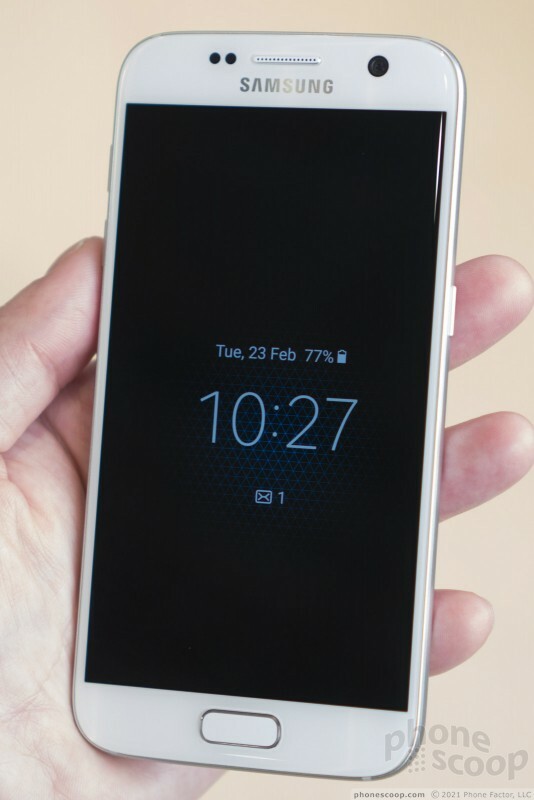 In fact, it looks very close to that of the Galaxy J3, which Phone Scoop just recently reviewed. 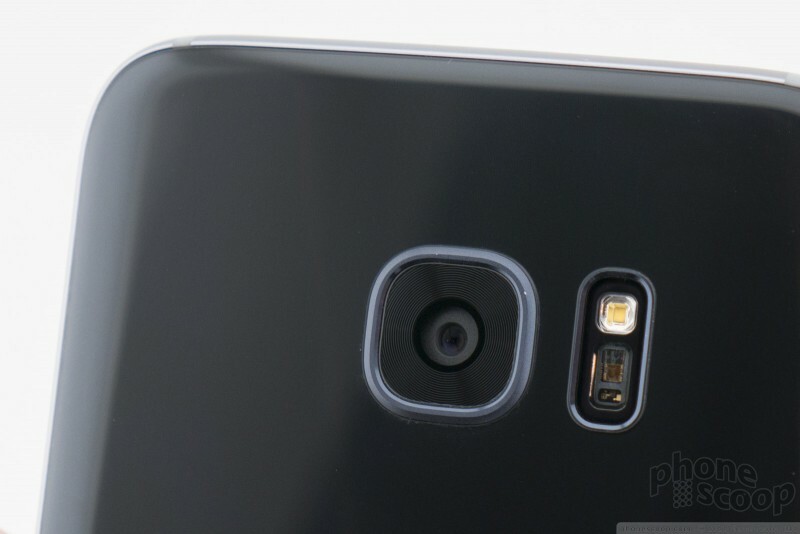 This is especially true with the camera app, which is more or less lifted directly from Samsung's older handsets. The camera itself drops from 16 megapixels to 12 megapixels, but Samsung claims the pixels are much larger for better low-light performance. For the record, this strategy never worked for HTC and its "ultra pixels" — so color me dubious for now. 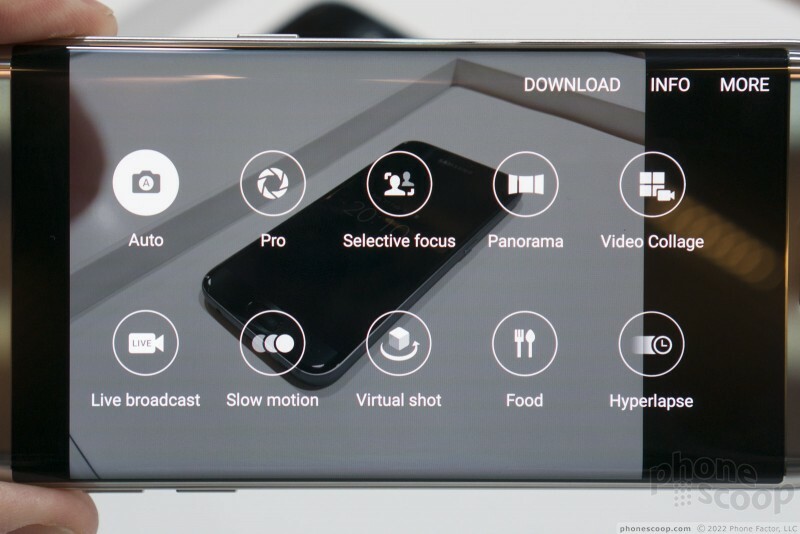 Samsung claims the phone focuses in fractions of a second, and the f/1.7 aperture should help a bit in darker environments. The phones both performed well during the few moments we spent with them. The software behaved and I didn't see any funky crashes or other issues. They were very quick, that's to be sure. 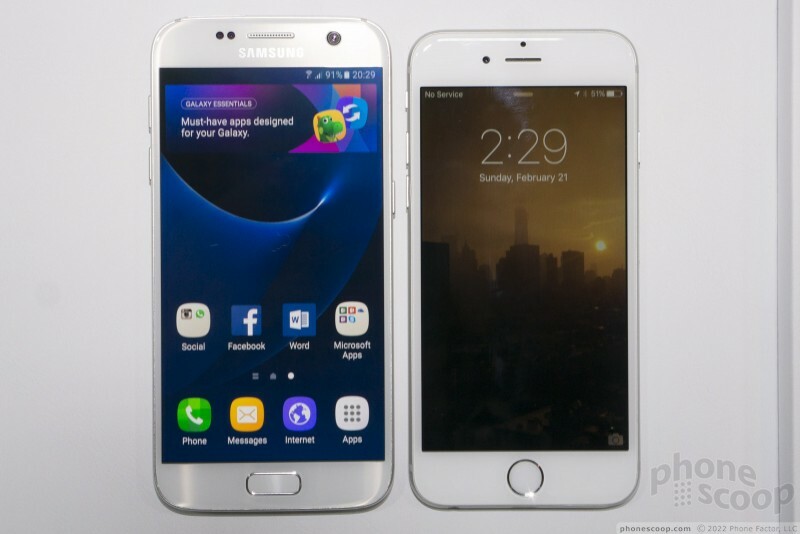 Samsung pulled an Apple, as far as I am concerned. 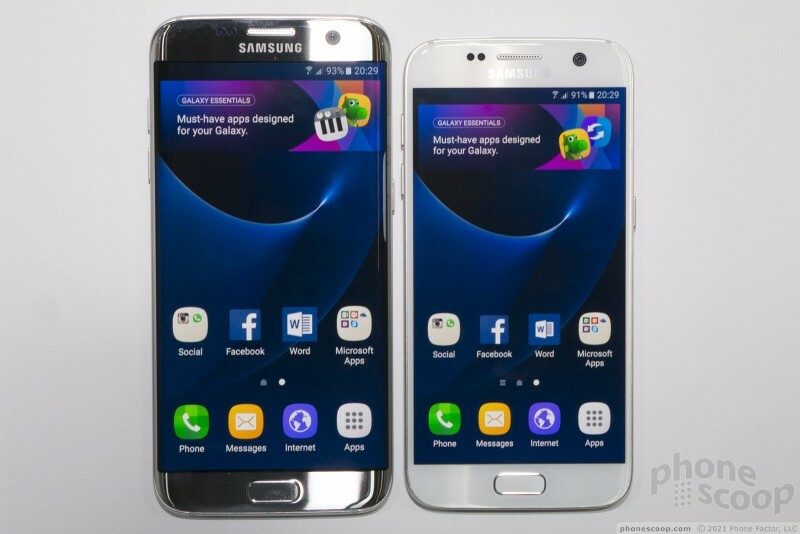 The Galaxy S7 is to the Galaxy S6 just as the iPhone 6s is to the iPhone 6. 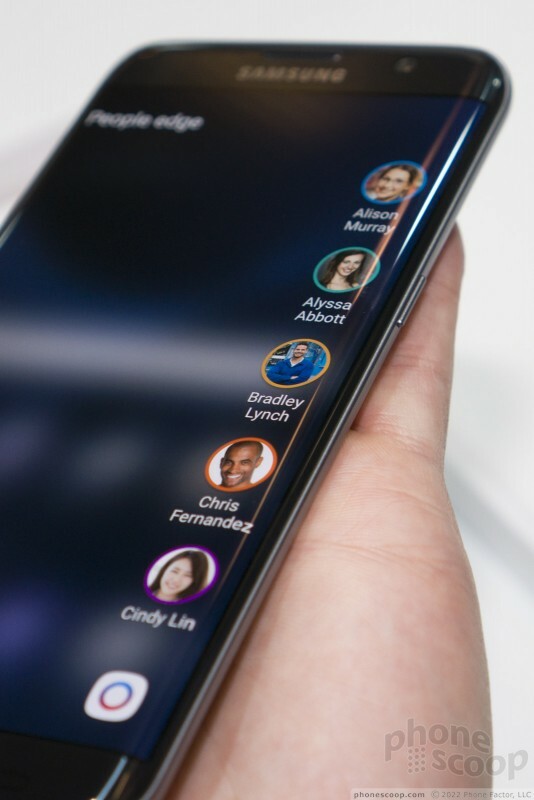 Samsung took a respectable piece of hardware and pushed it to the edge. 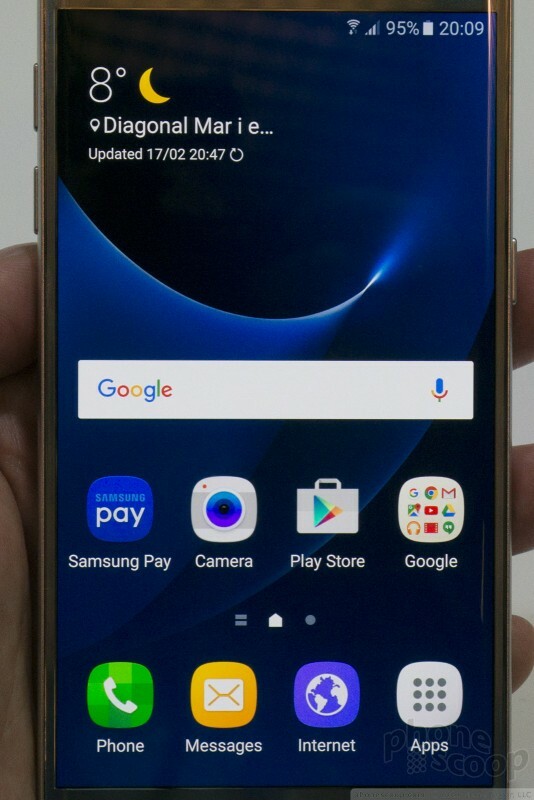 The GS7 and GS7 Edge are clearly improvements over Samsung's older phones, but we won't know how much better until we review them in full. 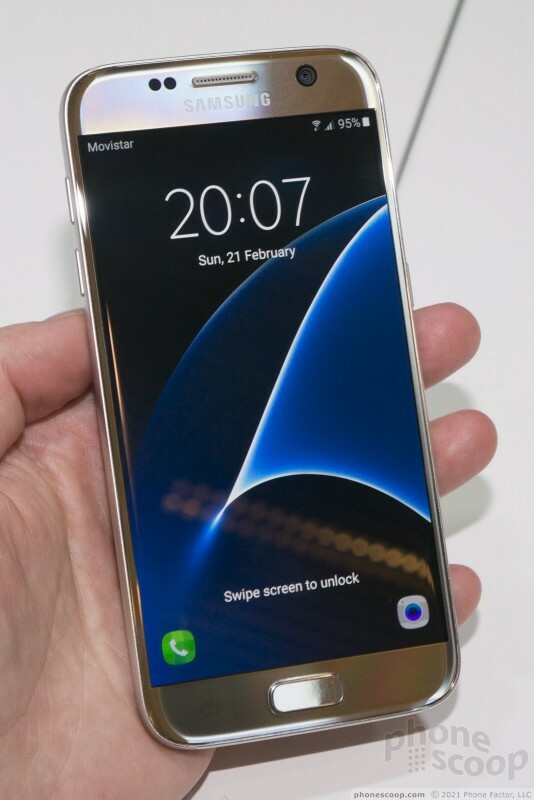 Expect to see more about the Galaxy S7 and Galaxy S7 Edge from Phone Scoop in the weeks ahead.